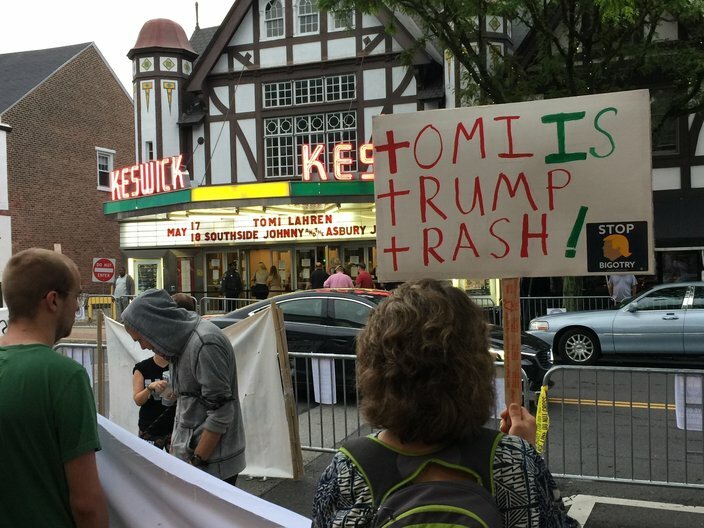 Tomi Lahren spoke with fans outside the Keswick Theatre before her speaking engagement started on Thursday, May 17, 2018. Much of the time she spoke, protesters drowned her words out from across the street. Brian Waddington stood at the front of the line outside Keswick Theatre, which made headlines earlier Thursday when a vandal spray painted “NAZIS DIE” on the building where conservative commentator Tomi Lahren would hold court later in the evening. The Fox News commentator’s “Family, Freedom & Final Thoughts” speaking engagement in Glenside wouldn’t start for another hour or so, but the South Jersey man was there with his daughter, fresh off meeting the star of the show at a VIP meet-and-greet. He also couldn’t say enough good things about Bullseye Burger House on the other side of the street, an area overtaken by protesters since his arrival. It was only natural that dueling sides would find themselves separated by a two-lane street and ample police barricades, what with Lahren being a lightning rod and all. Standing among people wearing shirts that read “Fox News and Chill” and various pro-Trump slogans – not to mention a plethora of “Stay Triggered” hats – Waddington took a measured approach to the inherent differences between the groups. But some knuckleheads did, in fact, start yelling. This got raucous in the hour leading up to the show – a time that saw Lahren give fans a pep talk before going inside – but Abington Township police kept things under control. Chants and pseudo-threats were offset, at least for a while, by show-goers who said they were driven by a desire to see the Fox News commentator with their very own eyes. That’s what brought Claudia Gilmore and her boyfriend, Troy Glendenning, both 18 years old, into this quaint Montgomery County town from Perkasie. If their ages strike you as an aberration, they weren’t. The crowd heading into the Keswick, which holds 1,300 people and was under a strict “no recording devices” edict, featured more than a few fans in their teens, 20s and 30s. 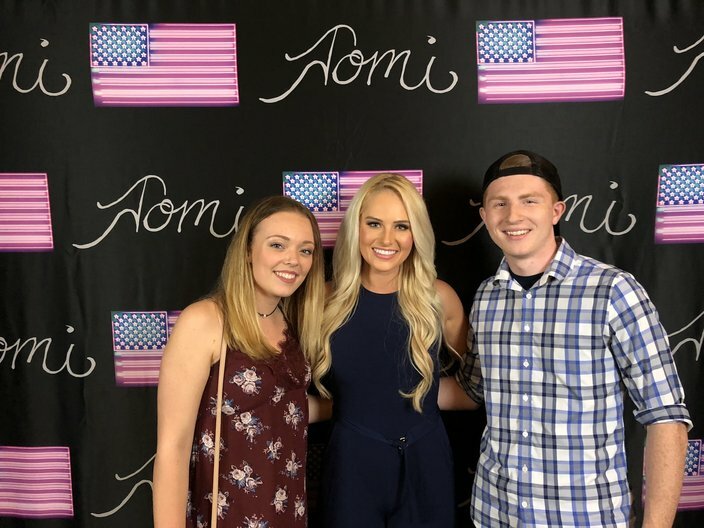 Claudia Gilmore and her boyfriend Troy Glendenning traveled from Perkasie for a chance to meet conservative commentator Tomi Lahren before her speaking engagement at the Keswick Theatre on Thursday, May 17, 2018. Also in that age demographic was 19-year-old Corey Feist from Nazareth, Northampton County, who would find himself leading “Lock her up” and “Build the wall” chants before the show started. 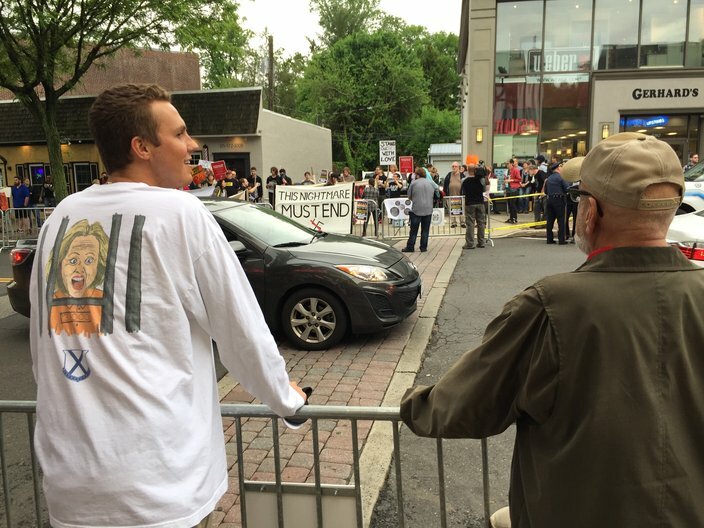 Nineteen-year-old Corey Feist (left) led several chants against the protesters outside Tomi Lahren's speaking engagement at the Keswick Theatre on Thursday, May 17, 2017. Suffice it to say, things would get vocally heated between the sides, who worked to drown one another out at various times in the hours leading up to Lahren’s event. “Build the wall” chants were met by a “Tear it down” response. A man in a Chevy Silverado – license plate reading “IM A HICK” and American flag waving atop the flatbed – held a box of tissues out of his window much to the delight of the Lahren crowd. At several points, profanities and slurs were yelled toward the protesters, but each time police stepped in to soothe fraying nerves before tensions could escalate. There was a palpable anger – albeit a sense of common purpose – on the Keswick side of the street, where people trotted out phrases from their regularly used playbook: Get a job, show your face, get over Hillary losing. Same went for the other side, though, where accusations painted attendees as racist and Nazis. Stopping outside for a few minutes before the show, Lahren offered her take on the First Amendment implications of the night. “You believe in free speech. They do not. You hold the high road,” she said to a crowd that posed for photographs with police officers as chants of “Shame, shame, shame” nearly drowned her out from across the street. For his part, Dino Kelly Cataldi from Dino’s Backstage Restaurant, next door to the theater, mulled how he should’ve been on the other side of the street. After all, he’s gay and has been married for 20 years. He kept an ear peeled for any slurs that would’ve prompted him to summon an officer to get someone removed from his block. He offered his take on it with the luxury of distance from the fray.